Because of the different rendering capabilities of e-mail clients your e-mail may be rendered differently in various clients. This can make it difficult for the readers to interpret the content. As marketers our goal is that our e-mails appear similarly in different clients. 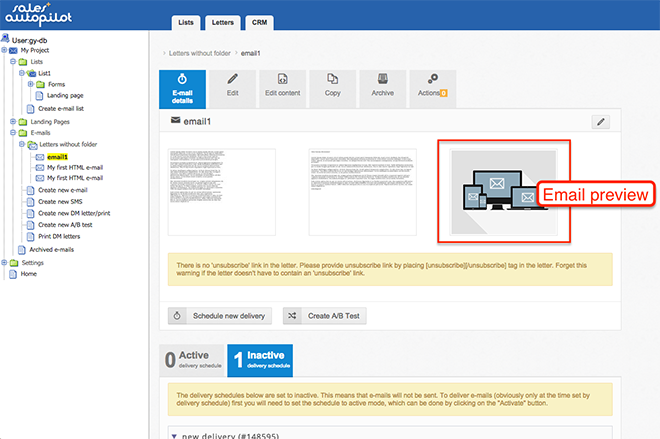 One tool for testing the preview of an e-mail is to send it to different e-mail accounts. But this is not always possible (for example one computer can run only one Outlook version at a time, but the are other barriers). The SalesAutopilot e-mail preview test could help you to see a preview of your e-mail in 48 variations of the most popular email clients, it provides code analysis and validation tools that help you get to the bottom of email rendering issues. This function includes a deliverability testing tool as well to help you determine which spam filters are flagging your emails. The fee is 4 EUR per test. This fee will be added to your monthly bill or automatically charged from your prepaid balance. 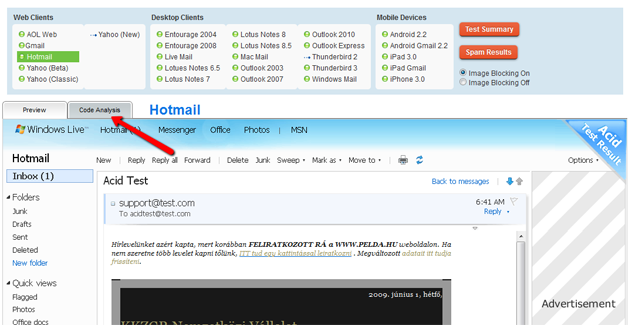 In the left menu click the e-mail that you want to test. In the main frame click the "E-mail preview" link. On the next screen select a delivery schedule by which you'll test the e-mail. It's important to choose a delivery schedule because the spam deliverability test needs a subject line and the sender's e-mail address. If you want to test the content of the e-mail only it's not necessary to select a delivery schedule. Press the "Start test" button to continue. In this screen you can select a user whose data will be used to personalize e-mail content in the test. It's important because if the e-mail includes merge tags these have to be replaced by personal data. After you chose a user click the "Start content check" button. SalesAutopilot starts to do the preview test, this could take a few minutes. During that phase the following message appears on the screen. If you change the content of your e-mail based on the test you can run the test multiple times and you can see the results separately. If one of the e-mail clients that is important to you reported errors or warnings click on the Code Analysis tab to see the detailed report. 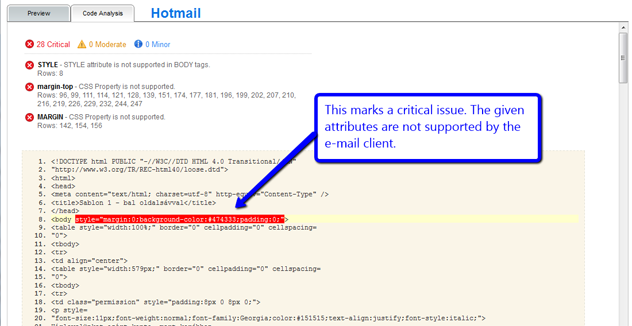 On the "Code Analysis" tab you can find the HTML attributes and styles that are not supported by the e-mail client. If the e-mail is created by someone else make print screens of the errors and forward it to the HTML e-mail editor or give them access to the SalesAutopilot. 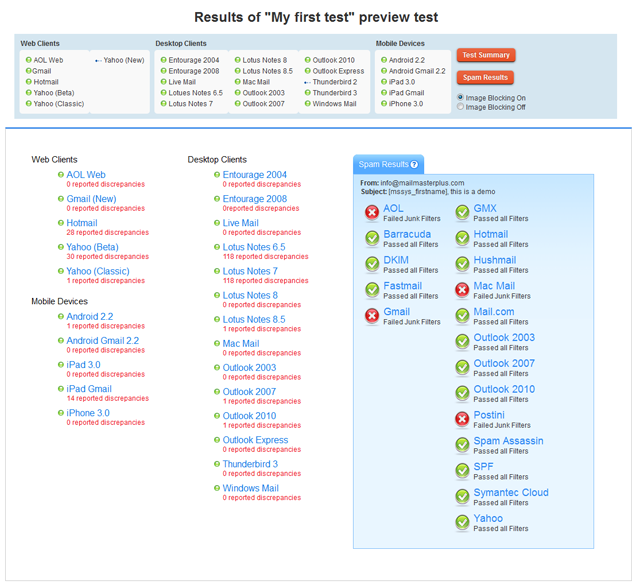 The preview test results are available anytime for free. Disclaimer: Test results represent reality in most of the cases. But it's possible that in some cases the test results differs from real results. Most SPAM blocking companies are very vague because they do not want people to learn how to get through their filters. Unfortunately this is the industry standard. Our system can only test the reputation of the sender address, subject lines and content using the default SPAM settings that come standard within email clients and popular SPAM filters. It cannot test other important factors such as sending server reputation, mailing list quality, engagement, and so on. Our company takes no responsibility for any damage caused by these differences.